“The oceans are rising and so are we!” chanted a crowd of 3,000 youth activists and supporters on the University of Michigan Diag on March 15, undampened in spirit by drizzle and chill. 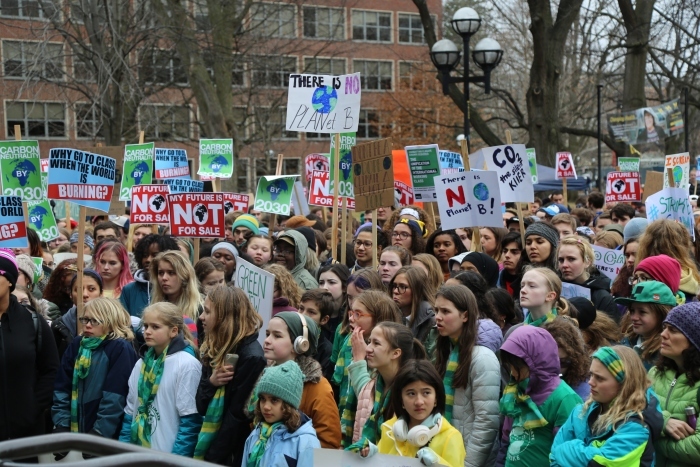 The rally near the Ecology Center’s Liberty Street office in Ann Arbor represented one among 2,052 youth-coordinated Global Climate Strike events across 123 countries and all seven continents. An estimated 1.4 million students worldwide skipped school that Friday to demand immediate and drastic action to curb climate change. The Youth Climate Strike movement, also known as Fridays For Future, began last summer with an individual protest outside of Sweden’s parliament building by 16-year-old high schooler Greta Thunberg. Small, wryly grim, and compelling, Thunberg sparked a wildfire, inspiring individual actions and mass youth strikes since fall 2018, culminating in this month’s global action. Many student organizers, including Washtenaw County’s, also cited the inspiration they’ve drawn from long activist histories of sit-ins and direct action, particularly by people of color and indigenous land and water protectors. 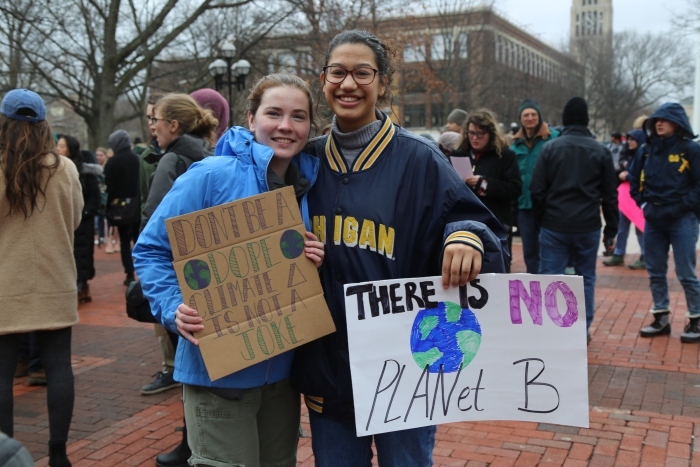 The Washtenaw County Climate Strike youth activists translated global climate goals into a detailed list of local demands. They asked for bold climate action at both the national and local levels. Many of those demands--including attaining full funding for Ann Arbor’s climate plan and getting UM to go carbon neutral--support the goals of the Ecology Center and the Ann Arbor Climate Partnership. In fact, several of the college student activists began organizing on UM’s campus in response to the Climate Partnership’s efforts. 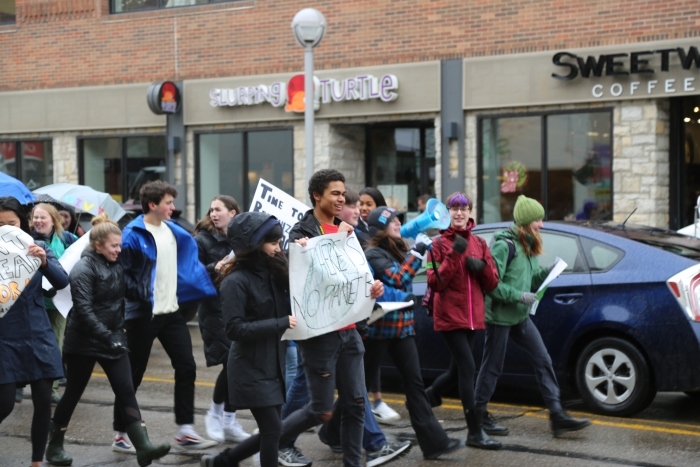 In support of their global and local demands, the Washtenaw County Climate Strike began with a walkout at 11:11 am as protesting youth and adults left their schools and workplaces to gather for the midday rally. The diverse, raincoat-clad crowd included clusters of small children with hand-drawn signs. A group from Summers Knoll Middle School dressed in matching green scarves and stood at the front to cheer their two classmates who spoke, heads barely poking above the podium. High school and college students sported slogans of all kinds: No Planet B, My Future is Not For Sale, Why go to class when the world is burning?, You Can’t Comb Over Climate Change. Adults of all ages populated the crowd, too, as supporters and, for the youngest, chaperones. Adult speakers included State Representative Yousef Rabhi, 2018 gubernatorial candidate Abdul El Sayed, activist Monica Lewis Patrick, and founder and Chair of the Washtenaw County Environmental Council Michelle Deatrick, who promised at the rally to begin a formal process to include youth members on that council. Eight passionate students took the stage as well: middle schoolers Avi and Leila; high schoolers Paige Duff, Zaynab Elkolaly, and Khadjia Khokhar; and University of Michigan students Mattie Bowen, Alice Leseman-Elliot, and Alejo Stark. Following the rally, the crowd proceeded in a march through the streets of downtown Ann Arbor. Police and youth organizers alike stood in intersections to shepherd the crowd safely through traffic. Some of the drivers stalled in their commutes honked in support and extended hands for high fives to the passing marchers. 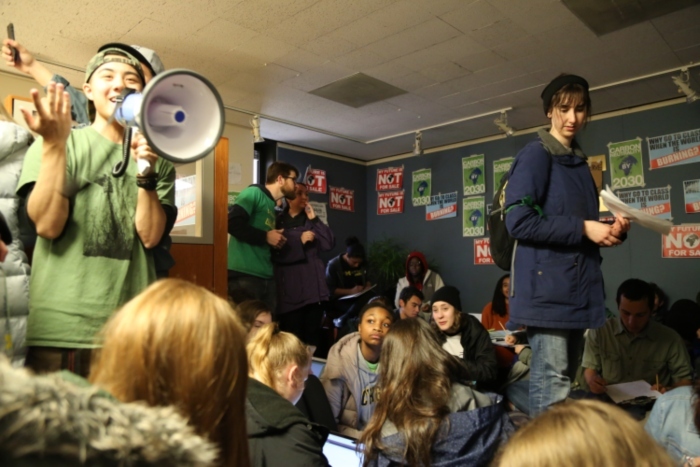 The march concluded at UM’s Fleming Administration Building, where several hundred students streamed up to President Mark Schlissel’s office to demand that the university pin down a timeline for reaching carbon neutrality. At the time of this article’s publication, the sit in continues. As we see this passion in the Ecology Center’s backyard and around the world, we’re taking heart. Here’s a new generation that’s growing up with environmental awareness and readiness to act. Here’s coordinated international action for healthy people and a healthy planet being spearheaded by kids. The United States movement, which comprised strikes in over 100 cities, was organized by three girls aged 12-16: Alexandria Villasenor, Haven Coleman, and Isra Hirsiy. 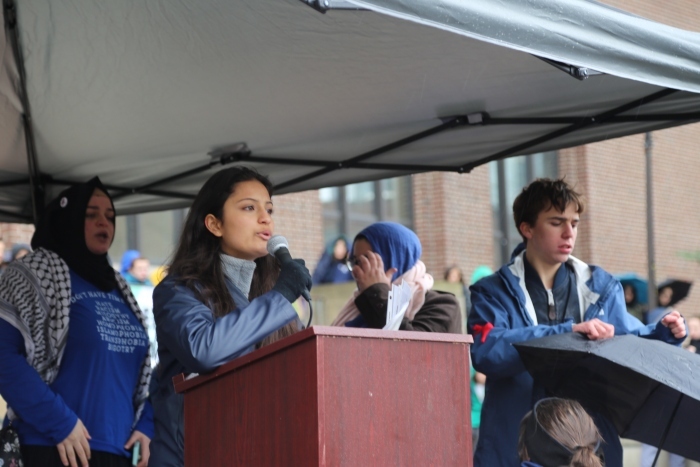 Washtenaw County’s action was also spearheaded by female high schoolers, Zaynab Elkolaly and Khadija Khokhar. It’s truly amazing. And indeed, youth activism is spurring changes already. Well before this rally, the Ecology Center supported University of Michigan students in a series of actions that led President Schlissel to commit UM to carbon neutrality--later than its Big 10 peers, and still without a fixed timeline or plan, but nonetheless a major commitment from a very large institution. This can’t only be a story about hope through the promise of young people as they come of age, though. For human survival on a healthy planet, it needs also to be a story about the response of older people now. Young people know that they will be the first generation to confront the fullest extent of global climate change, and possibly catastrophe. Global leaders committed in the 2015 Paris Agreement to keep the planet’s temperature increase in this century under 2 degrees Celsius. The UN has since concluded we only have 11 years left to prevent the worst by staying under 1.5 degrees of warming. That half degree makes a vast difference: half as many people to face water scarcity, hundreds of millions at less risk of death or malnourishment due to food shortages. Under current conditions, the planet on track to warm 4 degrees, and no place on Earth will be exempt from warming’s effects. A report out last week shows that the Great Lakes region is warming faster than the rest of the United States, resulting in extreme weather patterns that threaten agriculture and rising lake levels and flooding likely to put drinking water quality at risk. Young people are doing just that. How are you responding?